Ginga Denshou: Galaxy Odyssey is an action role playing game for the Family Computer Disk System. The game is an RPG-style overhead action-shooting game, with a vertical space-shoot-em-up used to connect the action levels. It is most similar to Guardian Legend or Super Star Force. The “RPG” elements come into play in that you’ll need to do lots of old-style RPG grinding, destroying enemies to collect Gold (used to buy more powerful weapons & equipment), Oxygen (which trickles down constantly in the action levels), Cannon Shots (powerful bullets), Life, etc. There is also a leveling system where on early planets, enemies drop only a little Gold, until you reach a certain amount, at which point they stop dropping Gold altogether. You’ll have to move on to a later planet to defeat tougher enemies, where they start dropping comparatively large amounts of Gold. That sort of thing. 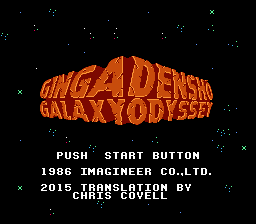 This is an English translation of Ginga Denshou: Galaxy Odyssey for the Family Computer Disk System. Headered version of this game is D38240DA. Find the headerless version or remove the header on the top row in a hex editor because the patching instructions state explicitly that this patch must be run on a rom without a header. Bytes to be removed are below.